Posted May 7th, 2012 by David Porter & filed under Social. 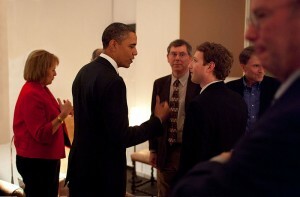 Obama Meets Zuckerberg; Steve Jobs’ Head Is Just Behind the President! Just as Facebook gets set to ask investors for enough investment dollars to value it at $1000 billion, now they are asking for people to sign up to donate kidneys, eyes, heart and other vitals in the event of their deaths. People can give blood while they are still alive. The two issues of cash and organs are not connected. Facebook is to offer network users the facility to enrol for organ donation, giving a new dimension to their famous strapline: ‘Facebook helps you connect and share with the people in your life’. This will be in the USA and the UK and is expected to increase the number of donors in both countries. those already enrolled will be able to add that fact to their Timelines ‘life event’ profiles. CEO Mark Zuckerberg said it was because of his friendship with Apple wizz-kid Steve Jobs who died in 2011 but had received a liver donation before he died. This claim to friendship may surprise some outsiders, but the call to donation shouldn’t. Most people support it; but few participate. Julie Steenhuysen writing for news agency Reuters on 2nd May 2012 reported Zuckerberg’s comments to ABC-TV’s Good Morning America programme: ‘we think that people can really help spread awareness of organ donation and that they want to participate in this to their friends, and we think that can be a big part in helping to solve the crisis’. The ‘crisis’ is the shortage of people coming forward to approve donation of their organs. In the US last year over 92,000 patients waited for kidney donation; less than a third of that many operations took place. If lack of awareness of the problem is making things worse, then high profile publicity on Facebook and a new cultural approval of gifting organs will help enormously. It’s Facebook’s power that can do good, at least in this respect. Zuckerberg said: ‘last year in Missouri, Facebook users tracked down and returned treasured mementos to families who thought they’d lost everything in the Joplin tornado. In Japan, people used Facebook to locate family and friends following the 2011 earthquake and tsunami. Smaller acts of kindness happen millions of times a day on Facebook’. In Britain, a new ‘health and well-being button’ will enable users to tell others they are donors, so that the culture of ‘sharing and connection’ will grow in this respect as well as data and viewpoints. There will be a link through to the NHS Blood and Transplant page for those not yet signed up to record their future contribution. Expressing an intention to sign up on Timeline will not, by itself, automatically enrol somebody on the scheme. The initiative has relaunched the national debate about whether we should have an ‘opt-out’ system for donation rather than ‘opt-in’. Now, people have to voluntarily sign up for it, and if they don’t, their relatives may have to decide. The argument runs that if everybody is automatically in the donation scheme, only those who have an objection can and need to opt out of it while still alive. That way relatives have no hard decisions to make in the immediate aftermath of bereavement and the quantity of organs available to help others would be closer to sufficient. Everybody hopes and believes the scheme will be extended globally in due course, as the need for new organs is worldwide. And as a bonus for anybody (or business) called Organ, they get an additional mention/publicity in the sidebars! Yahoo News, 2 May 2012. Facebook Organ Donation. and also.